of confession on Dec. 5. Photo by Lori Follett. 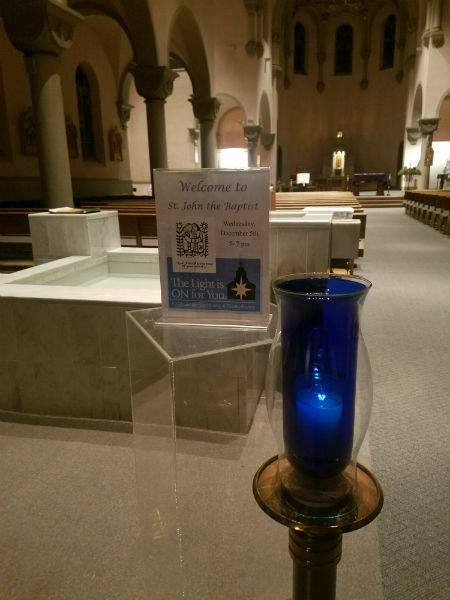 Erie County parishes opened their doors Wednesday for “The Light is On for You,” a special night of confession aimed at encouraging people to return to the sacrament of reconciliation. If the number of people who entered the confessionals at St. Luke Parish in Erie was any indication, the night was a success. The Diocese of Erie and individual parishes billed the event as an invitation for all to grow closer to God during Advent, a season in which the faithful prepare for Christ’s second coming at the end of time and also prepare for the anniversary of his birth. Adopted from an initiative of the same name that originated in the Archdiocese of Washington, it was held on a midweek evening to appeal to people who struggle to go to confession on weekends, when most parishes offer the sacrament. “We have to meet the people where they are,” said Father Jason Feigh, administrator of St. Francis Xavier Parish in McKean. Father Feigh said he heard 17 confessions during the two-hour event; typically, he hears two or three each Saturday. “Advent is a time of hope, and the greatest way we can receive hope is through Jesus’ gift of mercy,” Father Feigh said, adding that he’d like to see the event offered again during Lent and expanded to include all parishes within the 13-county diocese. Father Malthaner and Father Michael Ferrick, rector of St. Peter Cathedral and dean of the Erie West Deanery, solicited feedback from pastors throughout the county. “Anything we can do to encourage people to participate in sacrament is great,” Father Ferrick added. Lori Follett agrees. A parishioner at St. John the Baptist Parish in Erie who helped ready the parish for Wednesday’s event, Follett considers herself a “seasonal” participant, going to confession during Advent and Lent. Her work schedule sometimes makes it difficult to go on weekends, but she was able to take advantage of the evening hours Wednesday. “I love the idea” of offering more opportunities for confession, she said.